The numbers of security personnel killed remained constant over 2016 and 2017, and could stay at a similar level in 2018 should the trend seen so far this year hold. At least two youths from outside Jammu and Kashmir are reported to have been found involved in the throwing of stones at security forces in the state, Parliament was told Wednesday. “As per reports, 02 youth from other States of the country have been found involved in stone pelting in Jammu and Kashmir and in this regard, two FIRs have been registered in 2018,” Minister of State for Home Hansraj Ahir said in response to an unstarred question asked in Rajya Sabha by the BJP member from Madhya Pradesh, Prabhat Jha. 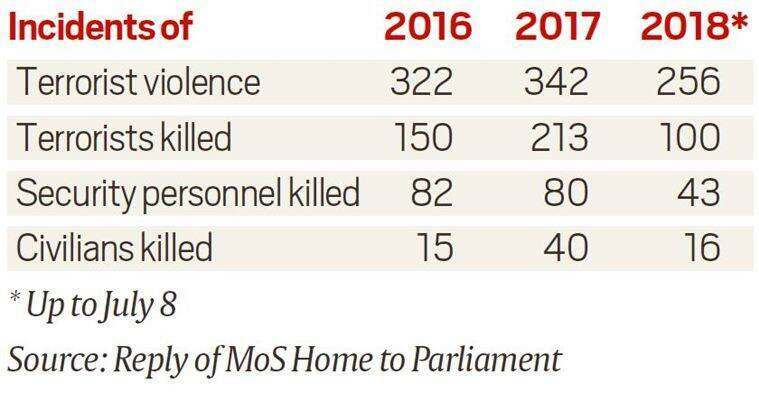 Numbers related to terrorist violence and the killings of terrorists, security personnel, and civilians in Jammu and Kashmir during the last two years and the current year given to Parliament by Ahir suggested that the number of incidents of terrorist violence in the state could increase in 2018 compared with 2017 and 2016, if trends seen in the first six months of this year remain unchanged. The number of terrorists killed in the state in 2017 rose by a third over the preceding year, whereas the numbers of civilians killed more than doubled in 2017 as compared to 2016. The numbers of security personnel killed remained constant over 2016 and 2017, and could stay at a similar level in 2018 should the trend seen so far this year hold. Jha had wanted to know “whether there has been a decline in terror incidents in the State of Jammu and Kashmir after terror funding to separatist organisations being probed by National Investigation Agency (NIA) and a clampdown on separatists leaders”, and “whether the case of involvement of youths from other States of the country in stone pelting on army jawans in Jammu and Kashmir has come to the light in recent times”.